This book is what I love about YA fiction. It is heartfelt and enthralling without being immature. Even after the first couple of chapters, I knew that I could trust this author. At the surface, this seems like just a story told by Jake after he suffers a tragic car accident that leaves him without his vocal chords. It's actually about so much more. - It had integrity. 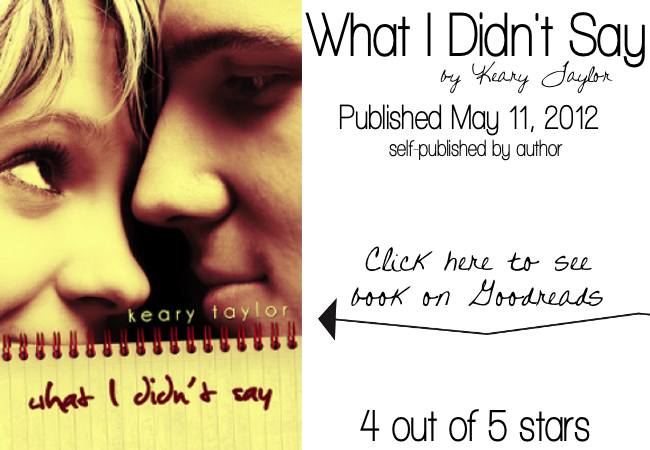 Taylor told the story with an earnestness that was entirely believable. I kept wondering if it was a true story because it really did feel more like an memoir than fiction. Jake and Sam were real people to me. - Great love story. This is one of those high school sweetheart stories that had me in tears. It wasn't over-the-top, and it didn't feel scripted. - Multi-layered. Don't be fooled by the title or the synopsis. This book is about so much more than Jake losing his voice. Sam has her own unfolding story that is so captivating. - No cliches. The story was entirely unique. The author didn't cut any corners with generic settings or characters. Jake's family and hometown were so different than anything I've read. $1.99 for a great book? I'm in! Only $1.99 on the Kindle?! Thanks for the tip! Sounds wonderful! Will definitely give it a try! I found your blog through the Southern Bloggers link up on Let Them Eat Cake!